Global complex supply chains have made it difficult to know the realities in factories. This structure obfuscates the networks, channels, and flows of communication between employers, workers, nongovernmental organizations and other vested intermediaries, creating a lack of transparency. Factories operate far from the brands themselves, often in developing countries where labor is cheap and regulations are weak. However, the emergence of social media and mobile technology has drawn the world closer together. Specifically, crowdsourcing is being used in an innovative way to gather feedback from outsourced laborers with access to digital platforms. This article examines how crowdsourcing platforms are used for both gathering and sharing information to foster accountability. We critically assess how these tools enable dialogue between brands and factory workers, making workers part of the greater conversation. 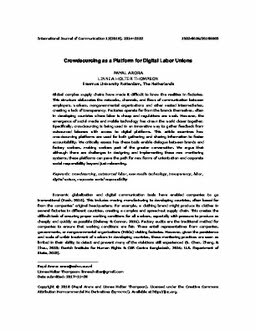 We argue that although there are challenges in designing and implementing these new monitoring systems, these platforms can pave the path for new forms of unionization and corporate social responsibility beyond just rebranding.